Even as you improve pick, pack and assembly speeds you're providing better ergonomics to help protect workers from motion injuries. 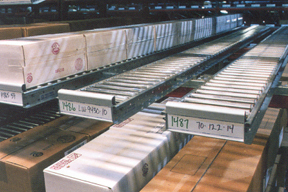 Carton flow systems make it easier for workers to reach items and keep them on task instead of moving boxes around for easier access. Carton flow also helps optimize storage space by keeping containers more densely stored. Choose from Unex, Keneco, Mallard, Hytrol, Interroll and many more for a gravity flow system that works. Cisco-Eagle can design, specify and integrate a custom solution to fit your precise needs.